It’s easy to laugh when Halifax drivers complain of traffic jams. Delays are minor compared to most of the world’s cities. It’s possible to get stuck in a long line of cars, notably near the two suspension bridges that span the harbour during rush hour, but overall driving is a good way to get around Halifax. Parking is more of a concern. It’s not uncommon to spend 10-15 minutes hunting for a spot and you’ll almost always have to pay for a place. The most central parking garages can be expensive. For shorter visits focused around the downtown core, driving doesn’t make much sense. Distances between the main attractions like Citadel Hill and the museums are easily walkable. Public buses, including the free Fred Shuttle (summers only), provide an alternative for tired feet. A car is essential for travel further afield, unless you want to take a tour or fork out for expensive taxi rides. With a car, the city’s shopping malls will be infinitely more accessible as will outlying attractions like Peggy’s Cove and Lawrencetown Beach. If you plan to spend a few days in Nova Scotia, explore Halifax first on foot and then rent a car for the rest of your vacation. The most common route into Halifax from Truro and northern Nova Scotia is on Highway 102. This splits near Fall River and you should take the left-bearing split, which becomes Highway 118. Follow signs for Highway 111 and the A. Murray Mackay Bridge. It’s a toll bridge and cars pay 1 dollar to cross. Once over the bridge, follow signs for Barrington Street if you want the waterfront. Robie Street runs parallel with Barrington Street, but a few blocks inland – closer for the public gardens and Dalhousie University. Highway 103 leads into Halifax from the coastal communities of Bridgewater and Lunenburg. Take Exit 2 for Highway 3, which leads down Quinpool Road, past Citadel Hill and all the way to the waterfront. The main route in from Windsor and Wolfville is Highway 101. Shortly after Lower Sackville, you have two options. 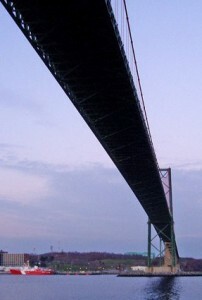 The most straight forward is to stay on Highway 101, which becomes Highway 7 (Windmill Road) and leads to the A. Murray Mackay toll bridge (see directions above from Truro). The other choice is to exit for Highway 102 (Bicenntenial Road) south and go around the harbour. Highway 102 finishes in north Halifax, near a cluster of shopping centres. If you don’t know the city, it could be difficult navigating from here to the downtown area.